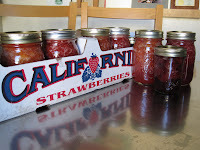 On the way home this weekend from the Sierra foothills I stopped at a fruit stand and bought fruit with the intent to preserve it in jars. A flat of strawberries called to me. This summer is unusually cool, and the berries looked good this late in the season. 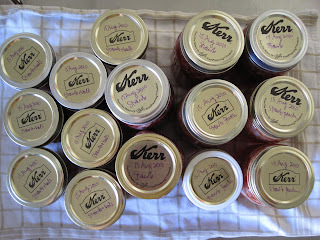 I scoured the kitchen and pulled out all the jars I could find, which was a surprisingly large number, considering I'd given my sister more than a dozen that were sitting around for several years. As I prepped the strawbs last night, I realized that a "full batch" recipe only used three plastic basketsful. And I had TWELVE in a flat. That's a lot of batches. And a lot of opportunity for experimenting in this new territory of preserving - I don't do this often. I think my first foray was putting up a dozen pints of brandied peaches in a previous life. I remember it was a lot of work and very rewarding. 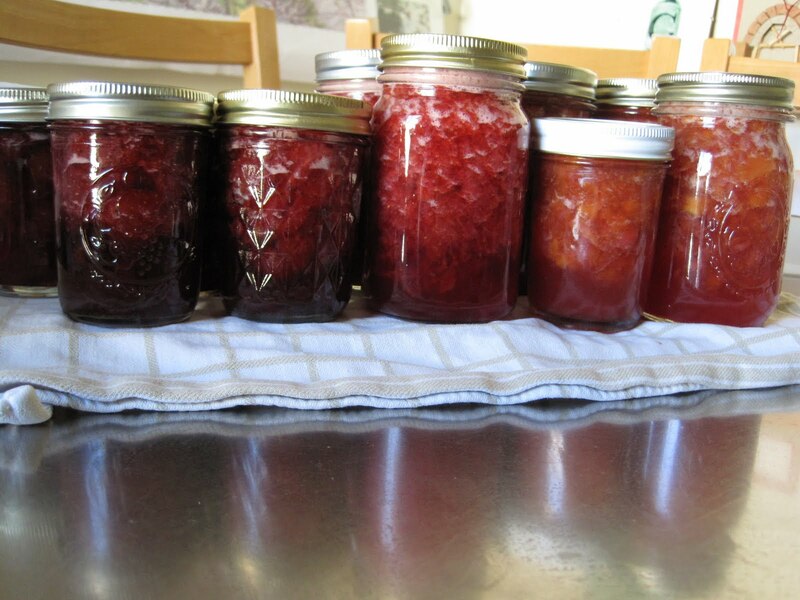 I also made blackberry jelly several years ago, and again more recently with two friends. We worked like a swiss watch and got a few dozen half-pints jars done in just a few hours. So of course I was primed to do this again. I found a few recipes, studied them, and decided to go with a few variations of my own because I did not have all the ingredients, but I figured I had the critical ones. 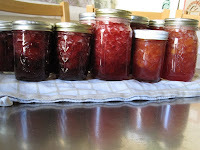 (L to R) 2-Strawbs with Balsamic, 1-Strawbs with a hint of Lavender, 2-Strawbs and Peaches with a hint of C.
And this was the final lineup which includes 7 pint jars. I love hearing the ping of a vacuum seal. It was a lot of work. It took a bit of time. And I used a ton of sugar. And there are still three baskets of strawbs in the fridge. Yep, I went into machine-mode, moving along with everything in its place: dry separated from wet, each workstation in order. Next time I'll either skim off the foam more diligently or fill the jars more quickly. I might try pickles next, or maybe something with a bunch of GREEN tomatoes because this unusually cool summer is going to end in just a few weeks, and that's all I'm going to get out of my garden. 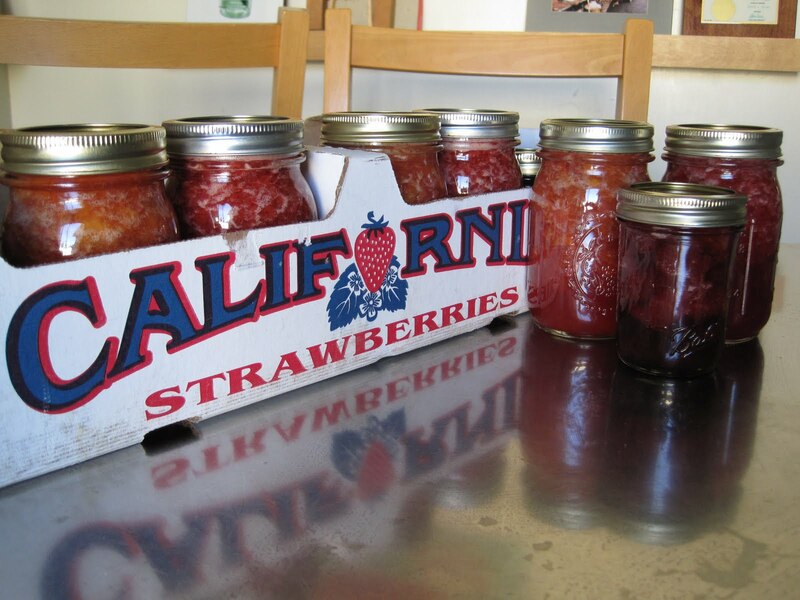 Wow, look at all of those preserves! I think it's a good thing I stayed home yesteray. ;) "Strawbs and Peaches with a hint of C"... what's the "C"? that's a "c"-cret that I'll reveal later!